In a few of life's rare occasions one argues as to whether or not having to wear 3D glasses on top of hurtful pimples for over an hour is worth it. Madagascar 3 proved to be one such occasion. A more than ample compensation, this writer would say. Some may even declare this sequel to be better than the original. It was dazzling, colourful and funny, retaining most of the amazing things from the originals, actually continuing the storyline from the second film and being awesome both for adults and children alike. Silly enough for children to love, witty enough for adults to be interested. Plot: We're going to Europe. Alex the Lion (Ben Stiller), Marty the Zebra (Chris Rock), Melman the Giraffe (David Schwimmer) and Gloria the Hippo (Jada Pinkett Smith) are pining for their home in New York and with King Julien, Maurice, Mort and the penguins in tow, they set out through France, Rome, London and the rest of Europe in a bid to make it to the Big Apple. On the way, they are faced with Captian Chantel DuBros, head of police animal control, a ruthless, more than terrifying woman who is crazy for Alex's head to complete her dead animal collection. Hiding from her, they join a travelling circus and reinvent the whole meaning of circus. 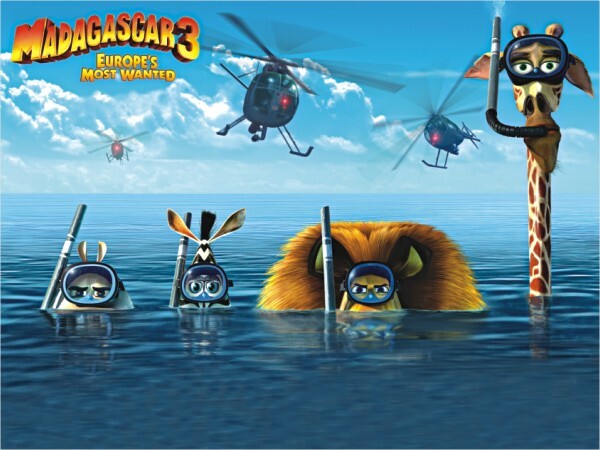 The movie, as you'd expect from the Madagascar series, is pretty great. The jokes come often and flow freely. King Julien, the Penguins and the Monkeys are hilarious. King Julien actually falls in love. We also have some new characters, such as Vitaly the Tiger and Gia the Jaguar and they fit in quite snugly. The stunts are little over the top but hey, it's a cartoon. Suspension of disbelief and all that. It's fun innocent entertainment and that's all you really need sometimes. Ice Age 1-3: The amazing adventures of Manny the Mammoth, Diego the Sabretooth and Sid the Sloth. Rio: The story of Blu, a domesticated Macaw on an adventure across Rio de Janeiro. Open Season: The unlikely friendship of Boog, a 900lb domesticated bear stranded in the wild and Elliott, an annoying mule deer. You can't find a wackier than the one you'll visit in “Quantum Conundrum”. Kim Swift, the lead designer of “Quantum Conundrum,” was the mastermind behind the 2007 classic “Portal,” and fans of that puzzle game should like this. Portals 1 and 2 was, simply stated, mechanics stretched to fascinating levels. Quantum Conundrum is a similar concept, basically a series of puzzles wrapped up in weird but mostly consistent physics. Portal and Quantum Conundrum share many similarities - starting with a strict non-violence pact. Yes, you can die but it's like a transition to another checkpoint. In fact, with a hero who is a child let loose in a scientist's house, everything moves at a gentle pace as you discover the limits of your powers through a series of physics-based puzzles. Only this time, instead of a reality-warping gun, you have a reality-warping glove. Professor Fitz Quadwrangle has discovered a way to switch among four dimensions with unusual physics. The “fluffy” and “heavy” dimensions make objects, respectively, lighter and heavier; you can also slow down time or reverse gravity. In each of the rooms in “Quantum Conundrum,” your mission is to use your primary tool, the Interdimensional Shift Device, to escape. For example, you may need to put a safe on a pressure-sensitive plate. By the final levels you'll be frantically juggling all four dimensions. The puzzles start basic - simply place the block on the pressure pad -easy. Pretty soon however, you need to start manipulating dimensional space which can be done in four ways. Once pressure pads require heavier objects or lasers make an appearance, you'll need to access Fluffy Dimension, a soft-focus bouncy mode that allows you to leap higher and lift previously unliftable objects. As you progress, other dimensions are revealed - making objects more solid, so they can block lasers for instance, reverse gravity or trigger slow motion. As in older puzzlers it's immediately clear what must be done in each level, but less certain how to do it. Too often, the satisfaction of figuring out the solution to one of Quantum Conundrum's fine puzzles is soured by the frustration of trying and failing, again and again. By the time you get to the next room, you've no intellectual pride left, only bitter relief. The Eureka moment - the defining pleasure of puzzle gaming - is almost lost down the gap between idea and execution. Quantum Conundrum is mostly a case of practice makes perfect rather than any greater test of ingenuity or intellect. 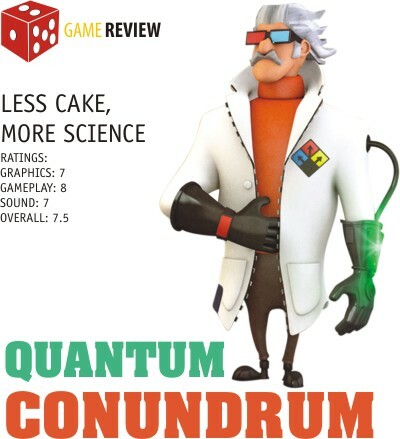 Quantum Conundrum feels like the PC's smartphone app - a simple idea, well executed. You'll play it for a few hours, enjoying the experience. The physics can feel wonky at times, but Quantum Conundrum crawls out from its spiritual predecessor's shadow to stand as a distinctive and occasionally brilliant game. Finally, Portal has a worthy rival. I'll be honest; after spending hundreds of hours of my life watching TV shows, I feel betrayed when they do not come up with something remotely good. I mean '2 Broke Girls' or Charlie Sheen's latest project 'Anger Management' is not exactly anything you would want to spend your precious time with but after searching through all of the internet offbeat British sitcoms, Black Books comes as quite a relief. 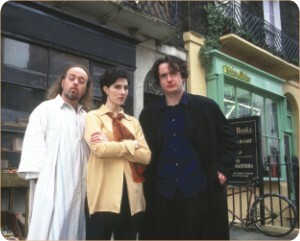 So the story goes like this: Bernard Black is the antisocial pessimistic owner of Black Books, a second hand book shop. Bernard doesn't really like people coming into his store and hates it even more when they want to buy anything. Manny, his only employee, is a polar opposite; very friendly but constantly paranoid and not really sure of anything he says or does. Next to their bookstore is the Nifty Gifty Gift Shop run by Bernard's only friend in the world, Fran. She is almost as weird as the other two, but has a stronger hold on reality. Daily chores turn out to be surrealist adventures with them and real life problems are usually in an uncharted land. You might still be unsure after hearing the stories, since a set of oddballs going on crazy adventures is all that networks like spewing out these days. But give this show a chance and you realise that it is genuinely funny and episodes range from simply bizarre to ludicrous. One moment they are going on a vacation 'to save money' the next moment they are opening up a restaurant to make customers stay in the shop; they do bring the crazy in big packs. The acting is superb and the dialogues are notoriously insulting. The first couple of episodes might seem a bit slow, but we suggest you to hang in there; you will be rewarded. 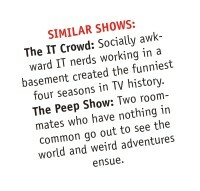 The show ran from 2000 to 2004, with three seasons and a total of eighteen episodes. That might not be much but it is certainly a hell lot of laughter. Tenacious D's last album, the soundtrack to their simply brilliant movie, The Pick of Destiny, came out all the way back in 2006. Talks of a permanent split of the D surfaced after the box office flop of the movie. Kyle Gass went as far as to say that they would quit while they were on a high. But the Metal cannot die. And Hollywood Jack and the Rage Kage are back with their new album, Rize of the Fenix. 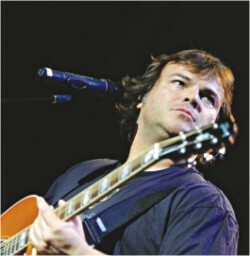 Jack Black has an amazing voice. It's iconic. It's got this dramatic, rock-opera style theatrical tone, it's unmistakable. What people sometimes overlook, seeing as the D are a comedic band, is that Jables is actually a really good singer. Kyle Gass' riffs aren't the most original throughout the album, and can sometimes come off as slightly lazy, but in the slower acoustic numbers, he shows off his guitar props. Another one good thing is that they have the legendary, Dave Grohl drumming on this album again. “Rize of the Fenix” is the first single from the album and it can be called the D's version of “Eye of the Tiger”. “Senorita” describes an epic bar fight with the guitar providing a Spanish tinge. “Roadie” is an operatic ode to the men hiding behind the curtains, making the concerts happen, this song is musically beautiful and this reviewer's personal favourite. “39”, a slow noxious tribute to a 39 year old girlfriend, is another one of the better songs. The album has two comedic skits, “Classical Teacher” (where JB hires a guitar teacher for Kage and it takes a weird turn) and “Flutes and Trombones” (where JB walks in on Kage recording flute tracks, whilst himself going into the studio with his trombone). “Throwdown” will have you tapping your feet along with the rhythm. The standout point is easily the simply epic, “The Ballad of Hollywood Jack and the Rage Kage”. This song is where Jables shows the full range of his vocal talents, whilst mixing emotion and humour seamlessly in the lyrics. Tenacious D's lyrics are always hilarious. This album continues that tradition, although newcomers to the band may find them to be a bit too vulgar. JB's vocals, Kage's guitar and Grohl's drumming make beautiful noise when they come together. The one complaint you could have with this album is the length of some of the songs, where you wish they were longer. Go to Youtube and watch the videos. You'll have tears from laughing. This album is just as good as Pick of Destiny, if not better.